The BRIT Awards 2018 nominations will be announced live on ITV on Saturday 13th January by one of the most popular and in demand presenters on UK TV, Emma Willis. 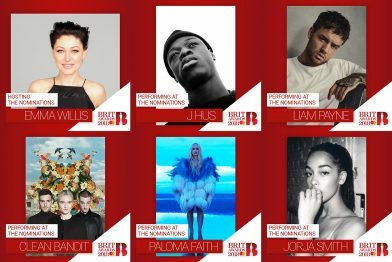 The show will also feature performances from some of the most exciting British acts of the moment including Paloma Faith, Clean Bandit, J Hus and Liam Payne as well as BRITs Critics’ Choice winner Jorja Smith. Paloma Faith is one of the most successful British female artists of the last decade and alongside Adele is the only British female to have three platinum albums under her belt. She recently returned with her latest album ‘The Architect’ which was also her first to top the UK Chart. No stranger to the BRIT Awards, Paloma previously won ‘Best British Female Solo Artist’ in 2015, with a further four nominations under her belt. In 2018 Paloma will embark on a nationwide arena tour including a show at London’s O2. Having sold almost 25 million records across the globe, including seven Top Five singles and three Number 1’s in the UK, Grammy- winning trio, Clean Bandit, have cemented themselves as one of the biggest British pop acts of the past five years. Their recent track ‘I Miss You’ featuring Julia Michaels, has racked up an incredible 35 million views to date. J Hus has had an incredible 2017 releasing one of the year’s biggest British breakthrough albums ‘Common Sense’ to critical acclaim. His Gold selling, Top Ten album followed a festival-packed Summer including performances at Wildlife, Parklife and Reading and Leeds before a European tour that included a sold-out show in his hometown of London at Brixton Academy. 2017 saw Liam Payne launch his solo career with ‘Strip That Down’ featuring Quavo, selling over six million records worldwide and making him the most successful current member of One Direction to date. His follow up top 20 track ‘Bedroom Floor’ will also feature on his debut album, due early next year. The nominations show will be hosted by Emma Willis, who successfully fronted last year’s nominations launch and the main show alongside Dermot O’Leary. Emma has a unique down to earth style and professionalism that has seen her become highly sought after and helped her to become one of the most successful presenters working in UK broadcast today. The 38th BRIT Awards will be broadcast live on ITV and take place for the eighth year in a row at The O2, London. Mastercard is celebrating its 20th year as headline sponsor of the BRIT Awards, and continues its sponsorship of the much sought-after Mastercard Album of the Year Award.